Now in its fourth year, visiting Three Square Food Bank to perform community service during the holiday season has become a tradition for Fulfillment Fund Las Vegas students. Each year, students engage in a different activity. 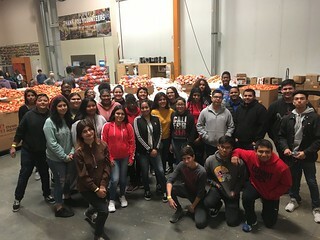 This time students packed oranges, onions, and potatoes for various Three Square partners throughout Southern Nevada including non-profit and faith-based organizations, schools and feeding sites. After two hours, our students helped pack 15,500 pounds of food that will ultimately help feed 3,100 families that are food insecure. In addition to performing community service, students received a tour of the Three Square facility and learned about the mission and services of the food bank. As in years prior, students expressed feeling a sense of purpose and satisfaction after spending their Saturday morning giving back to the community.